“Thanks for visiting our website. I hope you get a feeling for our school and the learning that goes on here. At Oakley College we are passionate about learning, everything we do has the learning of the child at the centre. Collectively we strive for a “confident learning community” where the whole school community is focused on learning in an atmosphere that recognises the importance of self-confidence. We believe that this can be done best in a caring family atmosphere, which is focused on quality and continual improvement. At the base of all the experiences in school are our values and it is these that shape the children for the future. It is these that become part of the developing individuals within the school. We make constant reference to Respect, Responsibility and Resolving problems for it is these key values that are at the heart of Oakley College. 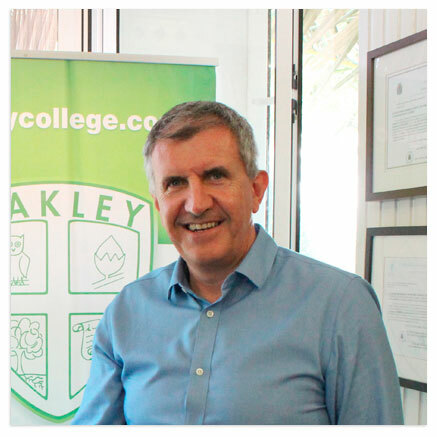 Have a browse through the website, arrange a visit at Oakley College to see the learning going on first hand, come and have a chat about what you want in education and how working together, we can make difference to your child’s future.”.